Jared Fogle, the former 425-pound Indiana University student turned national Subway pitchman, is launching his very own feel-good book: Jared, the Subway Guy. Winning Through Losing: 13 Steps for Turning Your Life Around. Will it be a thick book (à la David Foster Wallace?) or a thin one (à la Pat Fallon)? Hard to say. 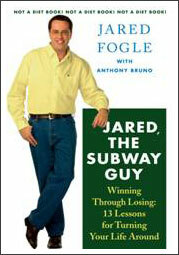 The press release says only that it’s “not a diet book” but rather “a motivational book from a young man determined enough to not only devise his own method for completely changing his life, but also willing to share his success with others.” Jared detractors will be saddened to learn from the press release that Fogle is “slated to continue in [his Subway] role indefinitely.” Jared fans, meanwhile, can rejoice—and catch their hero at the book’s launch party at noon this Monday at a Subway in Rockefeller Center. Agency.com staff may be there to help him out.